The route of 2017 Tour de France has been presented in Paris this morning, 18th October 2016. Running from Saturday July 1st to Sunday July 23th 2017, the 104th Tour de France will be made up of 21 stages and will cover a total distance of 3,516 kilometres. 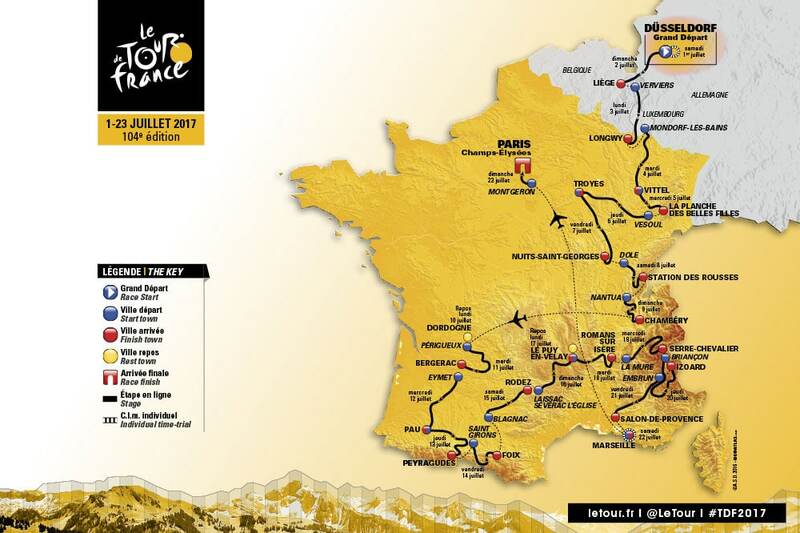 2017 Tour de France Route Rumours. This page will contain all the info I come across about the route of 2017 Tour de France up to the presentation on the route in October 2016. Rumours, hearsay and wild speculation. 2017 Tour de France will start in Germany. The 2017 Tour de France will be the 104th edition and will get under way from Düsseldorf. The presentation of the route of the 2017 Tour de France, will be in Paris on October 18, 2016. Updates 27th September 2016. Sunday 9th July Nantua Chambéry Followed by air transfer. Thursday 13th July 50th anniversary of Tom Simpson’s death. Mont Ventoux?? It’s possible and I have considered it, but! Will they really want to draw attention to a doped up rider dying on the race? Better than a doped up rider winning it, like the last 40 years! Do you think Thursday 13th will be ending Alpe d’huez?? There is currently nothing to indicate that Alpe d’huez will be included in 2017. Thursday 13th will be Serre Chevalier. Fingers crossed they will squeeze it in somewhere. Always my favourite state and place to be. Well thats confusing – here you say the 13th will be Serre Chevalier and above it says Luz ardiden? Seems unlikely that they will visit the Pyrenees first and alps seconds as they did last year. As long as i can remember it goes opposite each year. Which would mean Pyrenees in the last week? I have had confirmation from hotels in Serre Chevalier that the Tour is in the area 18th, 19th, 20th July. Therefore the Tour will be doing the Alps in the last week again, this will be 3 years running. The word is that Alpe d’huez is not appearing this year. All recent rumours concur with that. For the past 2 years it has been Pyrenees first and then the Alps. 2008 and 2009 also. All recent rumours suggest that next year will be the same. A lot of things have changed since July. No. It’s just rumour. Criterium du Dauphine had a stage finish there this year. The story for that was that it was a double stage deal, as is common. Host the Criterium du Dauphine and then get a stage of Le Tour. Meribel would fit in nicely with what is known of the route before and after that. This map is stage 6 of this years Dauphine. How sure are you that the tour will have its last few stages in the Pyrenees? We will be in the Alps around the end of July and would love to see tome of the Tour and were hoping that it might be spending the last week or so in the Alps. I have had confirmation from hotels in Serre Chevalier that the Tour is in the area 18th, 19th, 20th July. Therefore the Tour will be doing the Alps in the last week again. Latest rumours seem to confirm that your info is correct. As is stated above this is all just rumour. That said, I’m 100% certain it will not be in the Alps the last week. The weekend of the 14th will be the Alps. How much confidence of the Galibier? With your rumours of Meribel and then down to Col D’Izoard via Galibier, looks like St Jean de Maurienne valley could be a good place to be based for that week? Any suggestion of one of those stages taking in Les Lacets de Montvernier again?? Presuming that the start and finish are correct then the Maurienne valley is a certainty. I don’t think that there would be any other option other than Col de Madeleine, Col du Telégraphe and Col du Galibier. The stage would be about 160km. No mention of Les Lacets de Montvernier anywhere for 2017. With l’Etape du Tour being in the Alps the last two years, there must be a very good chance that it will be in the Pyrenees this year, is there any word on what stage and when it possibly will be? I have not heard anything about l’etape. The mayor of Rodez seems certain that Le Tour will visit his city next year. Haute-Loire between Pyrenees and Alps. I think it is very unlikely that Ventoux will appear in 2017. Any idea on the date of the Etape next year???? Is the tour going through normandy or Brittany in 2017 maybe Le Havre again . If the rumours are remotely accurate, then no. This article claims that there will be a stage finish at Peyragudes ski station. The opening of James Bond “Tomorrow never dies” was filmed there 20 years ago. Seems an unlikely reason for having a stage finish. Should be a good route with Col du Tourmalet included. I would prefer a stage Pau-Peyragudes with Monté-Bales-Peyresourde-Peyragudes than Tourmalet-Aspin-Azet-Peyragudes. This is too similar year a year. Does anyone know which date the Etape will be next year? I believe L’etape du Tour will be on Saturday 16th July, from Briançon to Col d’Izoard. Can you please tell me whether the Tour will overnight – both ending and beginning the next day – from Troyes on Thursday, July 6th? Merci! Yes, arrive on Thursday and depart on Friday 7th. Looking to find a good advantage point preferably on an incline. Is there any more specific information on the route for Stage 16? I will be in Lyon, just over an hour away from the end point in Romans sur Isere, so I’d love to find a spot along the route to watch that day – preferably one that is accessible by train so I don’t have to rent a car. Perhaps they are going through or near Valence? Anyone know what the reason is behind not publishing details of the route for each stage (ie. either an exact map showing the route or turn-by-turn directions)? I’d love to know what the routes are. Not sure why this is not being released. I have a Tacx bicycle trainer and I’d love to program the routes into my trainer so I can ‘ride’ the route beforehand. The full route is usually not available until about 2 weeks before the start of the race.